Right from kick-off it was obvious, something was amiss for second-placed Cruz Azul. To’o (Fereti) Gosche recognised this and snatched an early goal to put Moaula ahead. 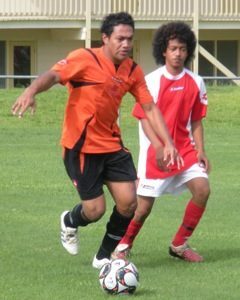 Paletaau Tapeni followed by slotting another in the 47th minute so Moaula were up by two goals. Penitito Tumua replied for Cruz; hoping to spark a comeback from his boys, but it wasn’t to be for the determined captain as Moaula pulled off another 2-1 victory to secure their place at the top of the standings table. “We didn’t play to our full potential, but we will just have to put that aside and focus on our upcoming semi-final match,” said Cruz player-coach Geoffrey Strickland. These two teams will go head-to-head again this weekend in the most-anticipated Cup semi-final. 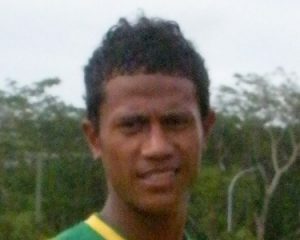 Cruz will look to correct this result for a spot in the inaugural Football Samoa Cup Final in May. In other matches, Togafuafua Saints were on the rampage in their 3-0 win over Moataa SC. Julius Ah Kuoi blasted a “Wayne Rooney-like goal” from a corner kick by older brother Kevin; the 17year old headed the ball right past Moataa defenders and goalkeeper. Goldstar Sogi returned to form in their, 4-2 victory over Vaivase-Tai, hopefully this will continue as they face Vaivase-Tai again, in the Plate semi-finals. Apia Youth will be doing some soul searching this week after their shocking, 8-1 loss to Kiwi SC.